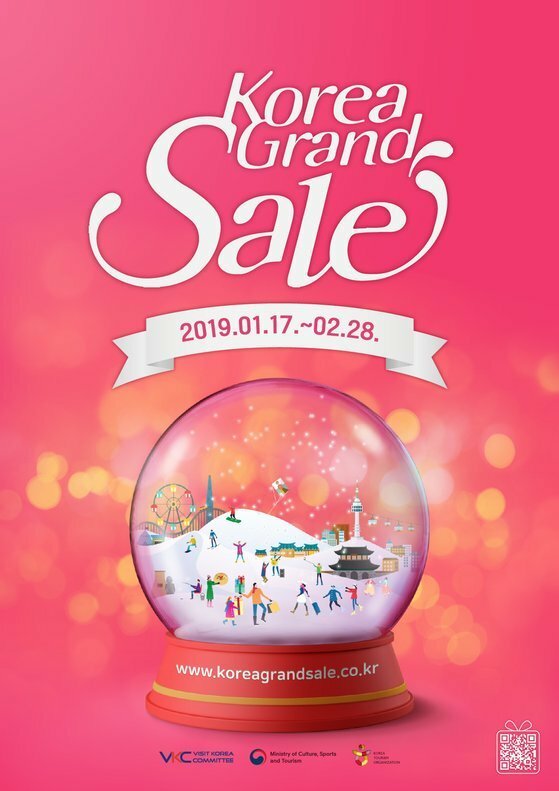 The Visit Korea Committee on Monday announced benefits and promotions for foreign tourists visiting Korea from Jan. 17 through Feb. 28, during the annual Korea Grand Sale. Under a theme of “Travel, Taste, Touch,” the event will offer promotions and benefits provided by 51,497 businesses. Participating firms include Jin Air and Jeju Air which will provide discount on inbound flights, Daemyung Resort, Ramada Encore Haeundae and Grand InterContinental for accommodations and food, and Paradise Casino Walkerhill and Seven Luck Casino for gaming coupons, as well as duty free shops. For transportation, bus tour packages will be available. This includes K-Travel Bus services with buy-one-get-one-free offers on seven routes connecting Seoul to Daegu, Gangwon Province, North Gyeongsang Province, South Jeolla Province, the North and South Chungcheong provinces, Changwon in South Gyeongsang Province and Incheon’s Ganghwado. Around 70 eateries are to take part in the “Korea Grand Tasting -- Special Tastes of Korea at Hotels,” offering discounts of up to 25 percent. Cooking classes held by I Love Hansik, O’ngo Food Communications, OME Cooking Lab and Cultural Corps of Korean Buddhism will also be available, along with discounts on their respective experience programs. Korea Smart Card, the operator for the Korea Tour Card launched last year jointly with the VKC, will unveil the mobile version of the Korea Tour Card. While it requires an extra fee to buy the card -- mobile or in physical form -- the company said it will provide the mobile version free of charge during the Korea Grand Sale period. This, however, is only available to Android phones with near-field communication functions. During the festival, main event center will be operate at Cheonggye Stream Square in central Seoul, starting with the opening ceremony for the event on Jan. 17. Interpretation services, information about the festival and other services like free Wi-Fi and a raffle will be available. A free Korea Smart Card will be given to the first 50 foreign visitors. For more information, visit www.koreagrandsale.co.kr/en.